Having followed the summer’s second transfer deadline day as well as I could last night, I’ve created final versions of the squad churn graphics that I’ve been tweeting out over the past month or so. I’ve harvested the data from the official retained lists, the BBC transfer page, Transfermarkt and a variety of Twitter sources, so hopefully I haven’t missed anything. You can see the all the data I’ve compiled here – please let me know via Twitter if you think I’ve gotten anything wrong. 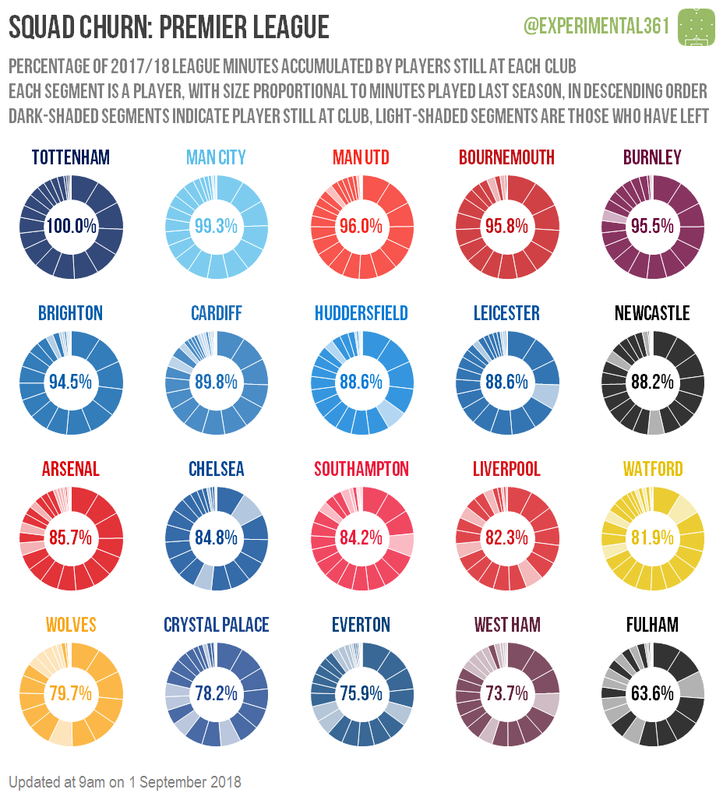 There’s a brief explanation of how these work at the top of each graphic, but in summary I’ve plotted a donut chart for each club where every player’s league minutes from last season is a separate segment, ordered from largest to smallest. I’ve then shaded them dark if they’re still at the club and light if they’ve left, so you can see at a glance how regularly the players a club has lost featured last season. A pattern which persists over time is that the higher up you are in the pecking order, the less your squad tends to changes from season-to-season. This seems to make sense as the top clubs will have more control over which players depart and when. What it means in practice is that these graphics will get more varied the further you scroll down. Not only did Tottenham make no signings this summer but they were also the only club in the top four English divisions not to lose anyone who played league football for them last season. The two Manchester clubs also kept their squads largely intact, with the most upheaval being seen at newly-promoted Fulham thanks to the number of loanees they used last season. Blackburn have kept the faith with the players who got them promoted, having lost fewer minutes from last season than any other Championship club by a significant margin. The three clubs relegated from the Premier League have overhauled their squads heavily, with Swansea in particular only retaining two of their six most-used players from last season. Only Hull will be less recognisable this season, having lost five of their six most regularly-deployed squad members and almost two thirds of last season’s playing minutes overall. As in the division above, it’s a newly-promoted side whose squad has retained the most minutes: Luton have only seen one of their 12 most-fielded players from last season depart. In fact all four clubs arriving from League 2 are in the top half of the graphic here, while the three who have dropped from the Championship sit in the bottom two rows. It’s the last row which is the most eye-opening however, with Peterborough and Bradford in particular having changed their personnel almost beyond recognition. Those two clubs have only retained around one minute of every five played in League 1 last season, while Shrewsbury, Wimbledon and Blackpool have also restructured heavily with around two thirds of last season’s playing minutes having departed. 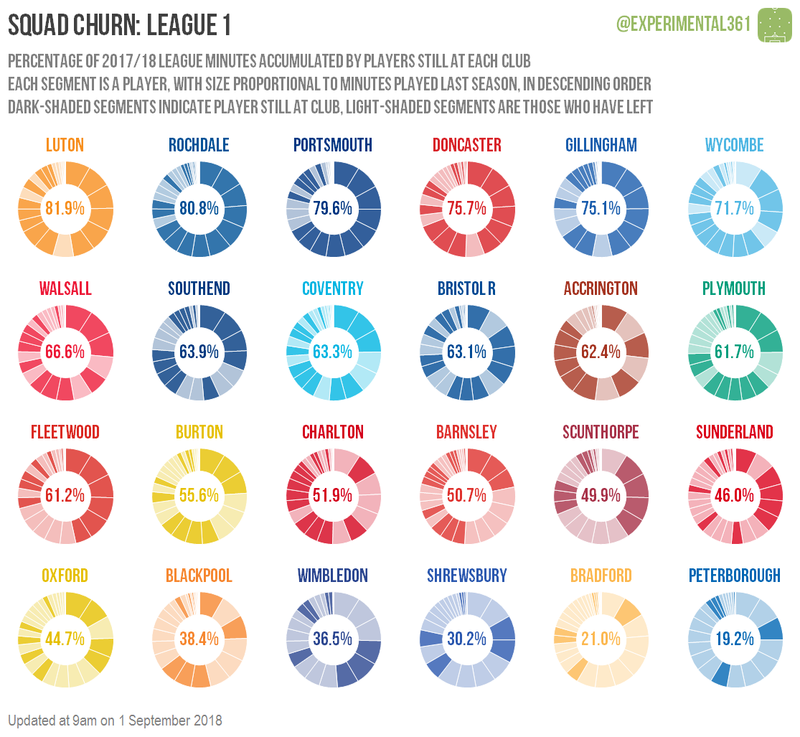 Cambridge and Crewe have changed the least since last season, having each retained the services of players who collectively accounted for around three quarters of their playing time last season. Despite missing out on promotion, Mansfield and Exeter have retained the majority of their core players from last season, while newly-promoted Tranmere also appear confident that last season’s players are worth keeping around. 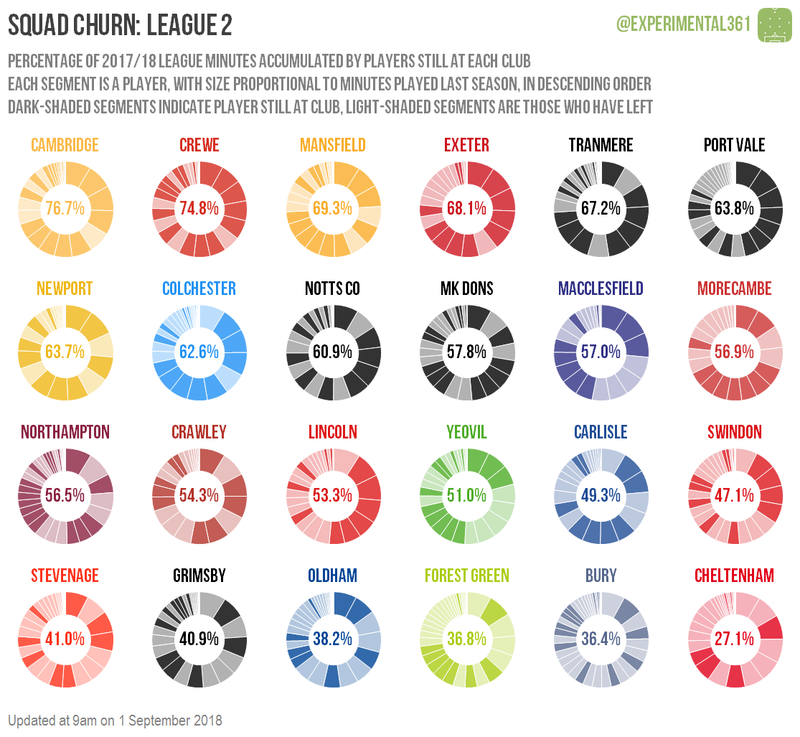 At the opposite end of the graphic Cheltenham have changed their team significantly since last season, with around three quarters of last season’s league minutes being racked up by players no longer at the club. Bury, Forest Green and Oldham have retained just a third of their 2017/18 minutes, so it’s hard to predict how they’ll fare this time around. 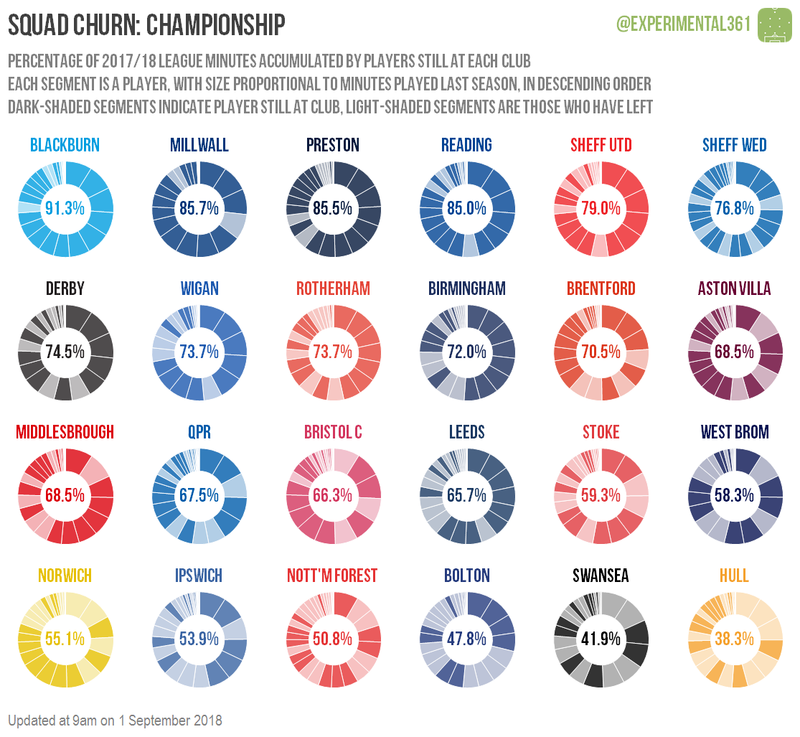 Quite a few people have asked whether it’s possible to measure whether squad churn is a good or a bad thing, so I’m definitely planning to have a look at that in more detail later this season. I suspect the answer may be a bit complicated, as it’ll depend on the type and quality of players who depart and also on who else they bring in, which isn’t captured here. Therefore I’ll probably measure churn differently – looking at how similar the distribution of players on the pitch changes over time – and maybe even trying to break it down by age and position.